V30 is released. The key feature of this version is “media gateway”. In fact, previous version has media gateway functions too, but these functions were combined in the same core with call-control and service-control tasks. For small size or middle size business, it is no problem to do that. But for huge size business, for example, our cloud-mss system, it could effect performance if media gateway is combined with other tasks. We decided to separate media gateway module into an independent application. In cloud system, media gateway can be run in separated device. Several call servers can share the same media gateway server. 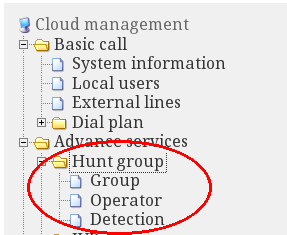 Since local MSS and cloud MSS have the same core, we merge this function back to V30. The difference is that the media gateway is an independent inner task in local MSS application. This feature doesn’t require any modification in configuration or GUI. By default, you should not notice this change. We believe new core can be more stabler and more flexible. Hope you can enjoy it! Some virtual servers in cloud-MSS system have been changed, please pay attention to these items. Each virtual SIP server will enable STUN feature. For example, if the SIP server address is “1234.s1.minisipserver.com”, its STUN server can also be the same address. That means “1234.s1.minisipserver.com” is also its STUN server address. Now we suggest “stun.minisipserver.com” by default. It is a simple public STUN server for all virtual SIP servers. Of course, you can still configure your virtual SIP server address as your STUN server. In voice-mail feature, we need a SMTP server to send emails with attached audio files. Each virtual SIP server can be configured with customers’ own SMTP servers. But we find it could make several problems. For example, most customers try to use Gmail SMTP server. Gmail SMTP server requires that you need enable POP/SMTP firstly, and grand other access. Most customers don’t know how to do that. So we disable SMTP server configurations. All voice mails will be sent from our own SMTP server. Most important is that you will need check your spam box if you cannot find voice email in ‘inbox’. (1) Some customers are professional communication providers for enterprises. They often install several cloud-mss servers for their own customers, so it is very useful if they can manage several nodes in one account. (2) Some cutstomers provide SIP-PBX services for their local subscribers with their own domain names, so they not only want to manage several virtual sip-pbx nodes in one account, but also want to get more discount pricing. We add ‘reseller’ function into cloud-mss system. It is free to register cloud-mss account and users can create and manage several cloud-mss nodes. Each node can be configured independantly just like common node. If you are interesting in this topic, please take a try and feel free to contact us if you have any question or suggestion. We are migrating cloud-mss servers to a new data centre which can provide more bandwidth and be more stable. The process will take one or two hours. We have to disconnect all our servers and we are very sorry to stop all customers’ services and thanks for your patient. We will update this blog if all jobs are finished. Thank you very much. 2013-01-31 UTC 09:18 updated: now, everything is ok!